Do you have a little one who is just learning to master scissors? Scissor Skills for children who have never picked up a pair of scissors before can be very daunting. Frustrations can build and the next thing you know, your little sweetheart is spiking the scissors across the table! Kids learn all things at different paces. Every developmental milestone and functional activity are achieved at different paces. Scissor use is no different. Kids as young as two can start to snip paper (and probably with an awkward-two handed grasp on the scissors!) And as their fine motor skills develop, will achieve more and more accuracy with scissor use. 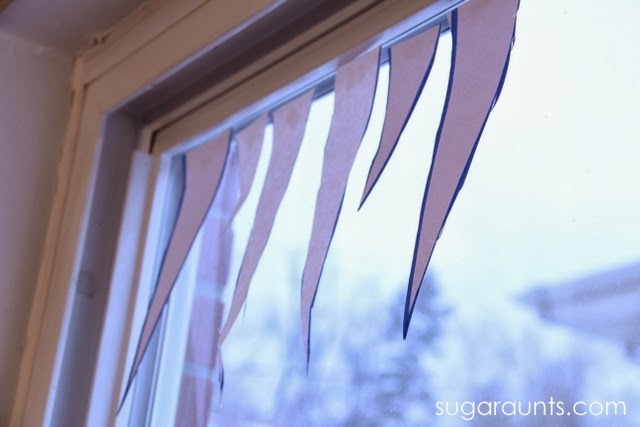 This winter themed Icicle cutting activity is a great beginner project for new scissor users. The strait cuts, bold lines, and even paper type are good modifications for a new little scissor-hands! Preschoolers are just beginning to gain more control over scissors. 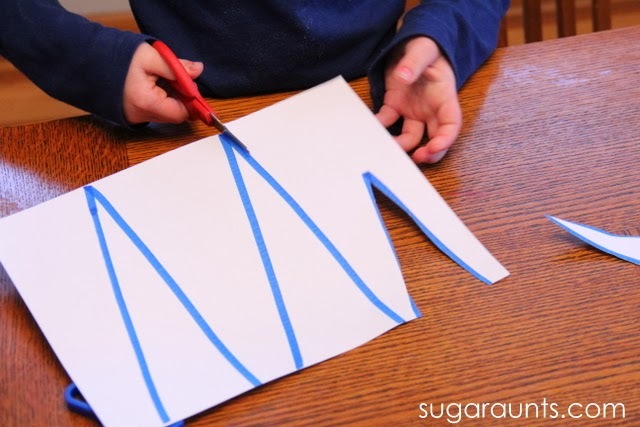 Strait lines are the perfect way to gain confidence when they are learning to cut...and ensure that they'll want to pick up the scissors and try another craft again soon! We started out with nice strait lines on these icicles. Little Guy could cut the whole way across the page without needing to rotate the page to cut a curve or angle. The smallest icicle could have been a harder task for him to cut, if he turned the whole page around like he started out doing. I prompted him to start one line from the edge of the paper and then instead of rotating the whole page (which would have probably given him a big chopped off icicle point), I showed him how to start the other side from the edge as well. He was much more accurate with the lines and wanted to keep going! We had two different types of paper for our icicles. The first set was drawn on a sheet of white cardstock . 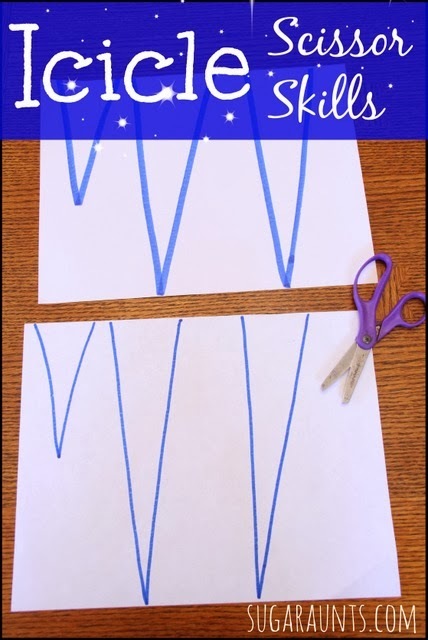 Cutting from this thicker paper is a great beginning step for new scissor users and a modification often used for kids with fine motor difficulties. The thicker paper requires slower snips and allows for more accuracy. I also drew the icicles on the cardstock with nice thick lines. This gave Little Guy more room to cut within the lines and allowed for less line deviation. 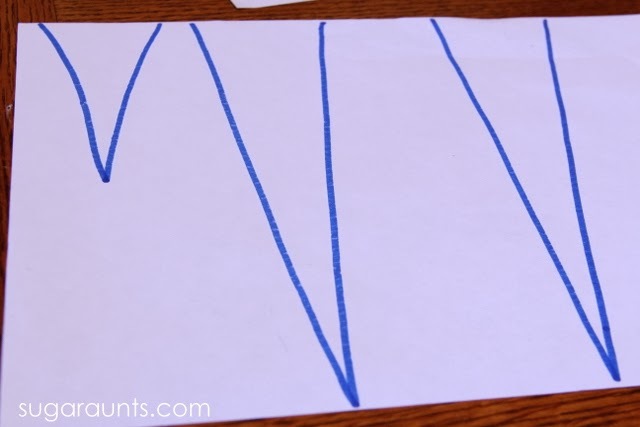 The second set of icicles were drawn with thinner lines on printer paper . After practicing on the first set, he was game to cut more icicles. The thinner paper and lines requires more control of the scissors and better line awareness, and bilateral hand coordination. This looked like so much fun, that even Big Sister wanted to get in on the icicle-making action! We hung our icicles in the window to match the icy conditions outside. Looking for more ways to practice beginning cutting? Check Scissor Skills page!